Enjoy a river cruise along the canals and waterways of Holland and Belgium as you take in their magnificent art collections, spellbinding gardens (including more than seven million tulips at Keukenhof Gardens), and enchanting medieval villages. The tour "Waterways of Holland and Belgium" was a truly wonderful, joyous experience - the places visited were interesting and often awe-inspiring; the ship was a lovely "base" and the leaders all were marvelous - and, I might add, we had a thoroughly delightful group of fellow travelers! 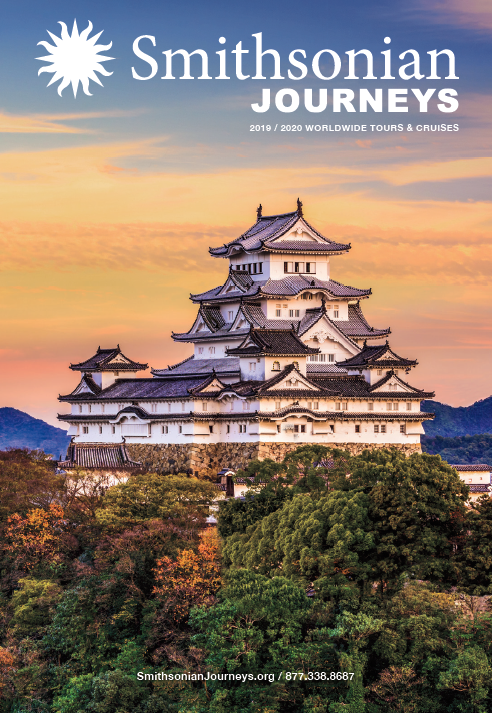 Save $250 per person* on our 2020 departures when you book by May 10, 2019! Our springtime cruise of Holland and Belgium showcases magnificent art and architecture, spellbinding gardens, and enchanting medieval villages. Observe windmills, fields of flowers, and other cultural traditions of the Low Countries as you cruise along delightful canals and rivers between *Amsterdam to Antwerp and enjoy a choice of included excursions. Amsterdam: Take a private cruise along Amsterdam’s historic canals, lined with 16th- and 17th-century gabled row houses, which have been designated a World Heritage site. Then choose from three excursions, including a trip to the world-renowned Keukenhof Gardens, where more than seven million tulips, daffodils, and other spring flowers are expected to be in bloom; an active bicycle trip in rural Waterland, an area of historical villages and wetland north of the city; or a more leisurely day featuring a guided tour of the Old Masters at the Rijksmuseum balanced with time at leisure. Giethoorn: Take a canal cruise of Giethoorn, regarded as the most picturesque village in Holland with its abundance of interlacing canals, and explore the town of Kampen. The Hague and Delft: Cruising south, choose from two compelling day excursions. In The Hague, explore sites associated with the seat of Dutch government, including the Parliament Building and the Peace Palace, then visit the Mauritshuis Museum, which showcases a fine collection of paintings by Vermeer and other Dutch Masters. Or choose to travel to the charming town of Delft, where you’ll stroll through Market Square with its historic and cultural highlights. After your walk, learn about the history and production of Delft porcelain at the renowned Royal Delft Porcelain Factory. Zeeland Coast: Come to understand the country’s continuous battle with the sea at the educational Delta Expo and then visit one of the storm surge barriers. Your Elegant Small-Ship Experience: Enjoy cruising aboard an upscale small river ship that features sophisticated staterooms and public spaces, superb amenities, excellent cuisine, and an informal ambiance. This cruise features the sister ships of Amadeus Silver III (2019) and Amadeus Star (2020). See more information about these sister ships on the Tour Details page. Please note that the direction of the cruise varies depending on departure date and is outlined under the Itinerary section below. Each voyage will also host other leading cultural and educational institutions, which will add to the excitement and energy of the experience. Choice #1 – Keukenhof Gardens: Explore Dutch the renowned Keukenhof Gardens, an 80-acre paradise of tulips, hyacinths and other beautiful flowers. Enjoy a short walk around the grounds with your expert guide and learn the story of these magnificent gardens. There’s time to follow your own path, and enjoy the flowers on your own. Choice #2 – Waterland Bike Hike: Travel to "Waterland" for a guided bike ride in a rural setting located just north of Amsterdam. Almost half the area consists of fen, a marshy wetland. Waterland is comprised of nine historical villages you’ll see Zunderdorp, Ransdorp, and Durgerdam. Bike helmets will be provided. Choice #3 – Visit the Old Masters: The Rijksmuseum is home to a remarkable display of Dutch art. Rembrandt’s Night Watch is one of the most famous works in the collection. Discover the works of Johannes Vermeer, Frans Hals, Jan Asselijn and Jan Steen to name a few. Linger longer and enjoy time on your own. Choice #1 – The Hague featuring Mauritshaus: Travel to The Hague, seat of the Dutch government. See the Peace Palace and the Binnenhof where the national parliament meets. Visit the residential suburb of Wassenaar, home to the King of the Netherlands. Visit the Mauritshuis Museum that showcases a remarkable collection of paintings by the Dutch Masters. Choice #2 – Royal Delft: Travel to Delft where a walking tour is planned. Stroll through the Market Square and see the historic and cultural highlights of Old Delft. Continue to the Royal Delft Porcelain Factory, established in the 17th-century, and learn about the history, development, and production of Delft Blue and Royal Delft. See a master painter at work and visit the museum that has treasured antique pieces on display. There’s free time on your own. Choice #1 – Cultural Bruges: Begin with a walking tour of this storybook town, located in West Flanders, with twisting lanes, canals, and arched bridges. See the Marketplace, Belfry Tower, the Town Hall and the Chapel of the Holy Blood. Visit the Groeninge Museum with its remarkable collection of Flemish and other noteworthy master painters. Choice #2 – Bruges and Beer: See the historic and cultural highlights of Bruges then visit the Brewery de Halve Maan where an expert guide will explain the process of brewing the famous Belgian beer. During the visit, you have the chance to sample the wares. Choice #3 – Bruges and Belgian Chocolate: Tour the historic and cultural points of interest in Bruges then visit a chocolatier where you’ll learn about the history of Belgian chocolate and sample some of the treats. Smithsonian Journeys travelers depart the U.S. for Brussels, Belgium. Upon arrival, at Brussels Airport transfer to Antwerp and embark the Amadeus Silver III. Your Smithsonian Journeys Travel Director will be on board to help with suggestions for independent activities. There is time to relax and settle in. Discover Antwerp on a guided walking tour. The city dates back to the 13th century and features a wealth of medieval architecture. Their treasures are preserved today in the city's many churches and museums. Antwerp is well-versed in gems of all sorts as more than 80% of the world's rough diamonds pass through the city's Diamantkwartier, making it the largest diamond district in the world. On this tour, you will learn about Contemporary Belgium from a local expert. Choice #1 –Cultural Bruges: During a guided walking tour of Bruges, stroll along winding cobbled lanes and across tiny arched bridges. View the bustling marketplace, Belfry Tower, the Town Hall and the Chapel of the Holy Blood. Afterward, visit the Groeninge Museum that offers a rich array of Belgian artwork. Highlights include collections by Flemish primitives, various Renaissance and Baroque masters, along with pieces from the Neo-classical periods of the 18th and 19th centuries. Choice #2 – Bruges and Beer: There is no doubt that Belgium is the country of beer since it offers more than 450 varieties of brew. You will begin your guided walk in Bruges where you are given the impression that you have stepped back in time. Your guide will lead you through the narrow, twisting cobblestone streets, passing by picturesque scenes of ancient buildings, tree-lined canals, and gabled facades. View the bustling marketplace, Belfry Tower, the Town Hall, and the Chapel of the Holy Blood. The highlight is undoubtedly a visit to a well-known local brewery De Halve Maan. At the end of your brewery tour, you will have a choice to taste one of their delicious Belgian beers. Choice #3 – Bruges and Belgian Chocolate: Bruges, the capital city of the province of West Flanders, is where you will learn much about this historic city. Join your guide for an entertaining walk through the quaint, cobbled streets and past centuries-old buildings, including the marketplace with its impressive Guild Halls. View the Belfry Tower that stands in the center of town, the Town Hall, the 12th century Gothic Basilica of the Holy Blood, which used to be the residence of the Count of Flanders, and the Church of Our Lady, a 13th-century cathedral. Then, you will walk to a chocolatier where you will enjoy an informative visit and learn about the history of Belgian chocolate. The story of the Netherlands and its battle with the sea is an epic one. Travel along the coast of Zeeland to the artificial island of Neeltje Jans and the Delta Expo. During an innovative audio-video presentation, learn about the Delta Works, a series of massive dams and storm surge barriers, conceived after the destructive North Sea flood in February 1953. There is time to visit one of the storm surge barriers. Return to the ship where the remainder of the day is at leisure in Veere. This morning depart from Kampen to visit the whimsical, car-free village of Giethoorn which seems to have materialized out of a fairy tale. Rove through the four miles of picturesque canals by boat. Afterward, wander on foot. Soak in the scene of exquisite, 18th-century farmhouses set against the Weerribben-Wieden National Park as you immerse yourself in the pleasures of small-town Dutch life. After breakfast aboard the ship, board a canal cruiser for a unique tour of Amsterdam. Cruise a portion of more than 60 miles of tree-lined canals and waterways. Admire some of the city's 1,500 bridges, dozens of islands, charming Dutch homes, and the architectural gems of the bustling city harbor during a guided cruise with a local expert. Choice #1 – Keukenhof Gardens: Explore the renowned Keukenhof Gardens, an 80-acre paradise of tulips, hyacinths and other beautiful flowers. Enjoy a short walk around the grounds with your expert guide and learn the story of these magnificent gardens. There’s time to follow your own path, and enjoy the flowers on your own. Choice #2 – Waterland Bike Hike: Travel to "Waterland" for a guided bike ride in a rural setting located just north of Amsterdam. Almost half the area consists of fen, a marshy wetland. Waterland is comprised of nine historical villages. You’ll see Zunderdorp, Ransdorp, and Durgerdam. Bike helmets will be provided. After breakfast, choose from three included shore excursions. Choice #2 – Waterland Bike Hike: Travel to “Waterland” for a guided bike ride in a rural setting located just north of Amsterdam. Almost half the area consists of fen, a marshy wetland. Waterland is comprised of nine historical villages. You’ll see Zunderdorp, Ransdorp, and Durgerdam. Bike helmets will be provided. Today, join one of two included tours ashore. Choice #1 – The Hague featuring Mauritshaus: Travel to The Hague, seat of the Dutch government. See the Peace Palace and the Binnenhof where the national parliament meets. Visit the residential suburb of Wassenaar, home to the King of the Netherlands. Visit the Mauritshuis Museum, which showcases a remarkable collection of paintings by the Dutch Masters. Choice #2 – Royal Delft: Travel to Delft where a walking tour is planned. Stroll through the Market Square and see the historic and cultural highlights of Old Delft. Continue to the Royal Delft Porcelain Factory, established in the 17th-century, and learn about the history, development, and production of Delft Blue and Royal Delft. See a master painter at work and visit the museum that has treasured antique pieces on display. Take your choice of one of the following included excursions in Bruges. Choice #3 – Bruges and Belgian Chocolate: Tour the historic and cultural points of interest in Bruges then visit a chocolaterie where you’ll learn about the history of Belgian chocolate and sample some of the treats. This morning, attend a talk by a local expert on Contemporary Belgium. Afterward, stroll through the city on a guided walking tour to see medieval architecture, and other historic and cultural treasures of the city. Antwerp dates back to the 13th century and features a wealth of medieval architecture. Their treasures are preserved today in the city's many churches and museums. Antwerp is well-versed in gems of all sorts as more than 80% of the world's rough diamonds pass through the city's Diamantkwartier, making it the largest diamond district in the world. Smithsonian Journeys travelers depart the U.S. for Brussels via overnight transatlantic flights. 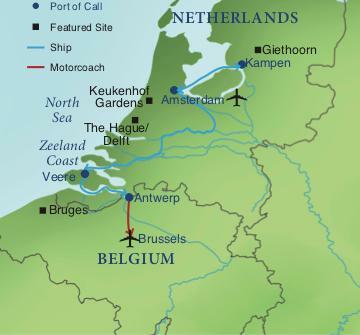 Upon arrival at Brussels Airport, transfer to Antwerp and embark the Amadeus Star. Stroll through Antwerp on a guided walking tour. Antwerp dates back to the 13th century and features a wealth of medieval architecture. Their treasures are preserved today in the city's many churches and museums. Antwerp is well-versed in gems of all sorts as more than 80% of the world's rough diamonds pass through the city's Diamantkwartier, making it the largest diamond district in the world. Take your choice of one of the following shore excursions in Bruges. Choice #1 –Cultural Bruges: During a guided walking tour of Bruges, stroll along winding cobbled lanes and across tiny arched bridges. View the bustling marketplace, Belfry Tower, the Town Hall and the Chapel of the Holy Blood. Afterward, visit the Groeninge Museum, which offers a rich array of Belgian artwork. Highlights include collections by Flemish primitives, various Renaissance and Baroque masters, along with pieces from the Neo-classical periods of the 18th and 19th centuries. Choice #1 –The Hague featuring Mauritshaus: Travel to The Hague, seat of the Dutch government. See the Peace Palace and the Binnenhof where the national parliament meets. Visit the residential suburb of Wassenaar, home to the King of the Netherlands. Visit the Mauritshuis Museum, which showcases a remarkable collection of paintings by the Dutch Masters. This morning depart Kampen and visit the whimsical, car-free village of Giethoorn which seems to have materialized out of a fairy tale. Rove through the four miles of picturesque canals by boat. Afterward, wander on foot. Soak in the scene of exquisite, 18th-century farmhouses set against the Weerribben-Wieden National Park as you immerse yourself in the pleasures of small-town Dutch life. Board a canal cruiser for a unique tour of Amsterdam. Cruise a portion of more than 60 miles of tree-lined canals and waterways. Admire some of the city's 1,500 bridges, dozens of islands, charming Dutch homes, and the architectural gems of the bustling city harbor during a guided cruise with a local expert. After breakfast, choose from three included excursions.